<h2>Hydrogen-powered boat plots course for the future of ocean travel</h2><br /><p><strong>But while Delafosse believes hydrogen is the energy of the future, he says the technology needs to be more efficient and cost-effective to really contribute to decarbonisation.</strong></p> <p><strong>Where did you get the inspiration to develop Energy Observer? </strong></p> <p>'This is more than a boat, it is a complete adventure. Victorien is a former ocean racer and cruise vessel officer, and he used to travel around the world on cruise ships that are emitting a lot of fine particles and CO2. That’s something that really started to affect him emotionally.</p> <p>'Myself, I’ve been working for the last 20 years at sea, filming my documentaries. I did a lot of deep-sea diving and would sail on many kinds of different boats, but most of the time I was polluting, of course. During my trips, I could really see the impact of humans on the ocean and on the environment in general. I was tired of always being a witness – I wanted to make a change for the better. '</p> <p><img class="@alignleft@" title="Every year, the technologies used to power the Energy Observer in its six-year round-the-world journey are being improved. 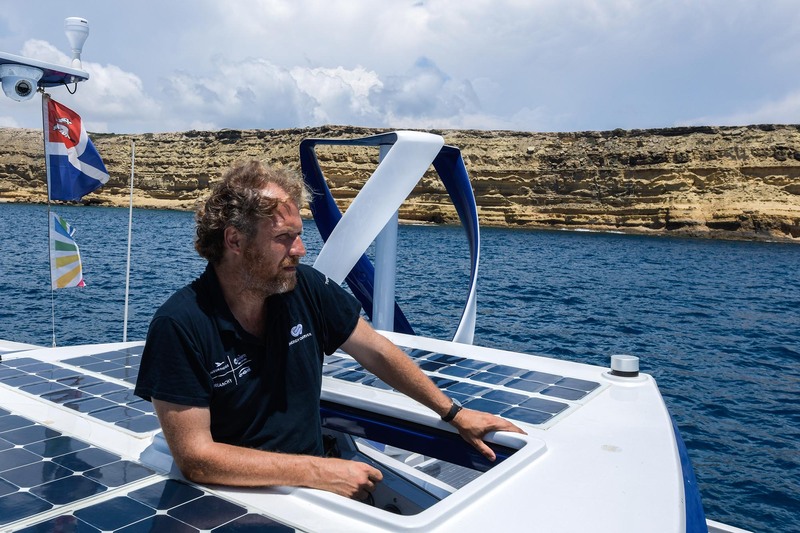 Image credit - Energy Observer" src="https://horizon-magazine.eu/sites/default/files/tilos-amelieconty.jpg" alt="Every year, the technologies used to power the Energy Observer in its six-year round-the-world journey are being improved. Image credit - Energy Observer" width="2000" height="1333" /></p> <p><strong>Energy Observer is now travelling around the world on its maiden voyage, visiting 101 ports and 50 countries in six years. What do you hope that this expedition will achieve?</strong></p> <p>'Our goal is to make a real 100% self-sufficient boat. Energy Observer is a floating laboratory. If you want to improve the technologies, you need time. I hope that six years is going to be enough. Every year we are changing things on the boat. This year we added some solar panels, next year we will add or remove something else. '</p> <p><strong>What was your first day on the boat like? </strong></p> <p>'The day that I started working on the boat, we knew it would work, we knew that we weren’t working on a dream. There is strong technology backing it up, amazing engineers. More than 40 engineers have been working on this project, but the first day we went out to sea was something magical. It’s completely amazing the feeling that you have at that time. After years of developing these things and sometimes doubting what we were doing, we felt very strong emotions due to the fact that we were actually getting our energy from nature, not a gas station. '</p> <p><strong>Why did you decide on hydrogen as the best way to power the boats? </strong></p> <p>'We have a problem with oil and we will have an even bigger problem in the next 50 years. It’s going to be the same with lithium (used in batteries). Lithium will run out one day, but we have hydrogen everywhere, it is the most common molecule in the universe. We have it in water in the oceans, in the air around us. It is everywhere, so we think it’s the best way of storing renewable energies that we can use. But we need to learn how to produce it at a lower cost and with more efficiency. '</p> <p> <div class="quote-view quotesBlock quote_horizontal"> <div class="quotesTop"><img src="https://horizon-magazine.eu/sites/all/themes/horizon/images/quotes_top.png" alt="" title="" /></div> <p>‘Our goal is to make a real 100% self-sufficient boat.’</p> <blockquote><p>Jérôme Delafosse, Expedition Leader, Energy Observer</p></blockquote> <div class="quotesBottom"><img src="https://horizon-magazine.eu/sites/all/themes/horizon/images/quotes_bottom.png" alt="" title="" /></div> </div> </p> <p><strong>There are also solar panels on the boat and wind turbines to capture wind energy. Do these serve as a back-up for the hydrogen? </strong></p> <p>'No, not at all, it is a mix. When the weather conditions allow us, with bright sun and wind, we sail with these renewable energy sources. When we are in the harbour, instead of losing all this energy, we store it. To do this, we send it through our hydrogen production chain. We electrolyse seawater to produce hydrogen and store it in high-pressure large tanks on the side of the boats. At night or when the weather is cloudy, we start to produce energy from hydrogen. '</p> <p><strong>How do you store the hydrogen?</strong></p> <p>'First, we desalinise the seawater, we deionise it, we electrolyse to free the hydrogen molecules and then we pump it into tanks where we compress it to 350 bars of pressure. And once it’s in the tanks, you don’t lose power or energy, because batteries are just consuming energy.</p> <p>'When you store hydrogen, it will be&nbsp;ok to use 10 years later. It’s very good for the future, because it means that you can store a huge amount of hydrogen. '</p> <p><strong>Gallery: The technology aboard Energy Observer </strong><em>(Click to see captions)</em></p> <p>@@@embed-media-gallery:3937@@@</p> <p><strong>Any disadvantages with hydrogen? </strong></p> <p>'The main problem with hydrogen is how we produce it. Realistically, we keep about 62kg of hydrogen on board when we are at full capacity. That is about 2 megawatts of energy. But to produce these 2 megawatts, we need about 4.7 megawatts of renewables. It is free energy, but it can take a long time to produce. We need to improve the technology to produce it more easily. This electrolysis technique accounts for about 2% of all hydrogen production. The other 98% of the hydrogen on the market nowadays is produced from oil or gas. We need to better develop electrolysis, which is the best way to decarbonise the world. '</p> <p><strong>What is your vision for the future? </strong></p> <p>'If you look at our private partners, they are all from completely different horizons, and they all need hydrogen. Hydrogen can be used to replace many of the fossil energies we use today - in houses, boat engines, little ferries, in cars. To us, this is the great hope for the future, that hydrogen could be used everywhere. '</p> <p><img class="@alignleft@" title="The Energy Observer team hopes to demonstrate how renewable energy and hydrogen can contribute to ocean travel. Image credit - Horizon" src="https://horizon-magazine.eu/sites/default/files/EnergyObserver_border.jpg" alt="The Energy Observer team hopes to demonstrate how renewable energy and hydrogen can contribute to ocean travel. Image credit - Horizon" width="983" height="1353" /></p> <p><em>The research in this article has received EU funding and was featured as part of <a href="http://eusew.eu/" target="_blank" rel="noopener noreferrer">Sustainable Energy Week</a>. If you liked this article, please consider sharing it on social media.</em></p> <p><a href="http://bit.ly/newsalertsignup" target="_blank" rel="noopener noreferrer"><img src="https://horizon-magazine.eu/sites/default/files/news-alert-final.jpg" alt="" width="983" height="222" /></a></p> <br /> <img src=”http://www.google-analytics.com/collect?v=1&tid=UA-40077089-1&cid=hydrogen-powered-boat-plots-course-for-the-future-of-ocean-travel&t=event&ec=republish&ea=read&el=hydrogen-powered-boat-plots-course-for-the-future-of-ocean-travel&cs=republish&cm=republish&cn=republish&cm1=1" /> This post <a href="https://horizon-magazine.eu/article/hydrogen-powered-boat-plots-course-future-ocean-travel.html">Hydrogen-powered boat plots course for the future of ocean travel</a> was originally published on <a href="https://horizon-magazine.eu/">Horizon: the EU Research &amp; Innovation magazine | European Commission</a>. 'This is more than a boat, it is a complete adventure. Victorien is a former ocean racer and cruise vessel officer, and he used to travel around the world on cruise ships that are emitting a lot of fine particles and CO2. That’s something that really started to affect him emotionally. 'First, we desalinise the seawater, we deionise it, we electrolyse to free the hydrogen molecules and then we pump it into tanks where we compress it to 350 bars of pressure. And once it’s in the tanks, you don’t lose power or energy, because batteries are just consuming energy. The research in this article has received EU funding and was featured as part of Sustainable Energy Week. If you liked this article, please consider sharing it on social media.